Murasamejō (むらさめじょう, lit. "Murasame Castle") is one of 9-Volt's microgames in the Japanese version of WarioWare: D.I.Y. It is based on the Family Computer Disk System game Nazo no Murasame Jō. Because Nazo no Murasame Jō was never released outside Japan until its Nintendo 3DS Virtual Console re-release in 2014, in Western versions of WarioWare: D.I.Y., it was replaced by the microgame Pikmin, which features completely different gameplay. The protagonist Takamaru stays in the center of the screen, while an enemy ninja is found in each corner. The four ninjas hiding in the woods throw shurikens at Takamaru. 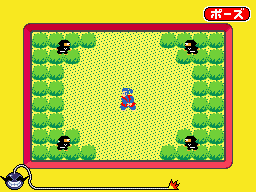 The player has to tap Takamaru in order to make him invisible, allowing him to avoid the ninja attacks. The player wins when the protagonist stays unharmed until the end of the game. When a shuriken hits Takamaru, he gets knocked out and the player loses the game. This page was last edited on October 14, 2018, at 09:02.